POLR3D antibody LS-C196766 is an unconjugated mouse monoclonal antibody to human POLR3D. Validated for ELISA. POLR3D antibody was raised against pOLR3D (-, aa296-395 partial recombinant protein with GST tag. MW of the GST tag alone is 26 KDa. 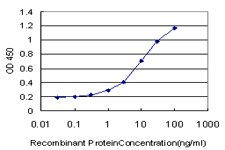 Detection limit for recombinant GST tagged POLR3D is approximately 0.3 ng/ml as a capture antibody.